These crispy bites have been popping up in restaurants over the past couple of years. We had always shrugged them off, but since they are our sister-in-law’s favorite, we decided to give them a try. 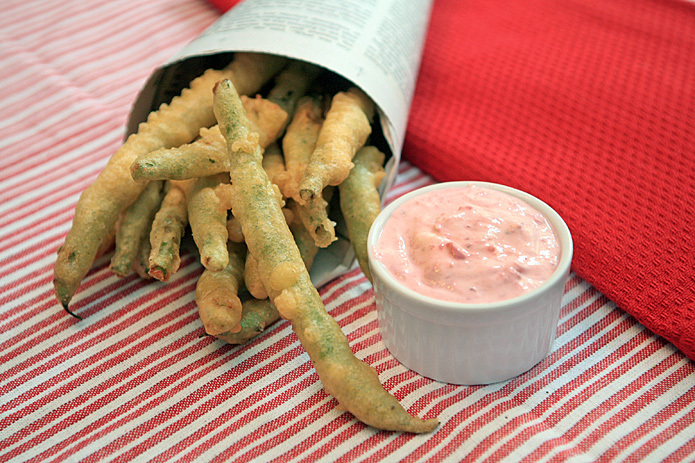 After just one bite, we fell in love with these deep fried green beans; talk about delicious! And the dipping sauce totally hits this crowd-pleasing appetizer out of the ball park. Now our question is, are they still considered a vegetable? And if so, that means the calories don’t count? Combine the sour cream and fresh strawberry jam with a pinch of salt. Transfer to a serving dish and chill to allow the flavors to combine. Place your green beans into a small bowl and microwave for about 30 seconds. This will give your green beans a start on the cooking process, but still leave a crispness to them after they are fried. Combine 1 cup water, flour, cornmeal, season salt and eggs in a bowl to form a batter. Dip the beans in the batter, a dozen at a time, and place them into the oil. Flip about 2 minutes to brown each side. Remember to fry them up in batches so you don’t crowd the pan and bring down the temperature of the oil. Cool on a cooling rack. Sprinkle with salt while hot so the salt with stick. Serve the fried beans with the strawberry dipping sauce. These would be great with rasberry sauce! Yum!!!! When I made fried pickles, I knew there was just a little something missing. I decided next time to use season salt in the batter to add a bit more flavor. Just realized you used it your batter, so it must work. Looking forward to trying fried green beans next time I’m frying veggies! Thanks Victoria. I will try a rasberry sauce the next time I make them! Kelly: They are really good. In fact, you might want to make two batches because they will go fast! We can’t wait to make the fried pickles! This looks great, planning to try tomorrow What does self-rising flour add? Can I use regular flour? I’m going to try the sauce with chopped tart cherry jam. Thank you. Use All Purpose Flour for this recipe.